Gujarat is a state in North west coast of India and it know locally as Jewel of the west. This states shares its border with Rajasthan in north, Maharashtra in south, Madhya Pradesh in east and Arabian Sea is west. Whenever we talk about Gujarat, obviously we will talk about Mahatma Gandhi,the father of nation. But tody we are going to talk about their cuisine and their foods. Yes after Goan cuisine, today we are landing to Gujarat. As we know Gujarati foods are primarily vegetarian, its one of the healthiest cuisine in India. A typical Gujarati thali consists of roti or bakri prepared with wheat flour or millet flour,served along with dal or kadhi, rice and side dishes called sabzi. Pickles or chhundas are serves as condiments.Butter milk is considered as a must have in their daily menu and their dishes are distinctivey sweet,salty and spicy at the same time. Gujarati cuisine have many popular dishes and the list is very much big. Ghevar,basundi,malpua are famous desserts and some their snacks like Mathris, chorafali,ghooghra are well known everywhere. Khaman Dhokla, Khandvi, Handva,Kachori, daal dhokli, Dhokla, fafda,Ganthia,khakhra are most of their evening snacks, these dishes are eaten all over India and they are carried by Gujarati community towards the Southern part of India.Coming to today's recipe this Farsi poori or puri are deep fried crunchy pooris you can munch with a cup of tea for your snacks. These addictive pooris are prepared with simple ingredients and if you can have these crispy pooris you want stop urself just with one. They stay prefect for a week in room temperature, if they are conserved properly.This crispy flat breads are kid's favourite, i loved mine with my cup of coffee.Sending to my own event Healthy Diet-Cooking with Wholegrains guest hosted by Nupur. Grind the peppercorns, carom seeds, and cumin seeds as bit coarse powder. Now take the maida,semolina,grounded spices, salt, two tablespoons of oil in a bowl. Gradually add water and knead everything as soft and pliable dough, cover it with a towel and keep side for hour an hour. Divide the dough into 4 equall balls. Roll each dough ball as thin chappathis, apply the oil and roll it firmy like a log. Cut the roll horizontally into small pieces. Roll each pieces as thick disc. Heat oil for deep frying, fry the rolled disc on low heat until they turns golden brown. Remove from fire, drain the oil with paper towel. Let it cool completely and store in air tightened box. nicely made farsi puris Priya, just need a cup of tea with this. wow tis s a good recipe.. These puri look like an addictive snack. Good pick for the state. So delicious, and thank you for the great info about Gujarat! simple n flavourful puri,need to try it!! 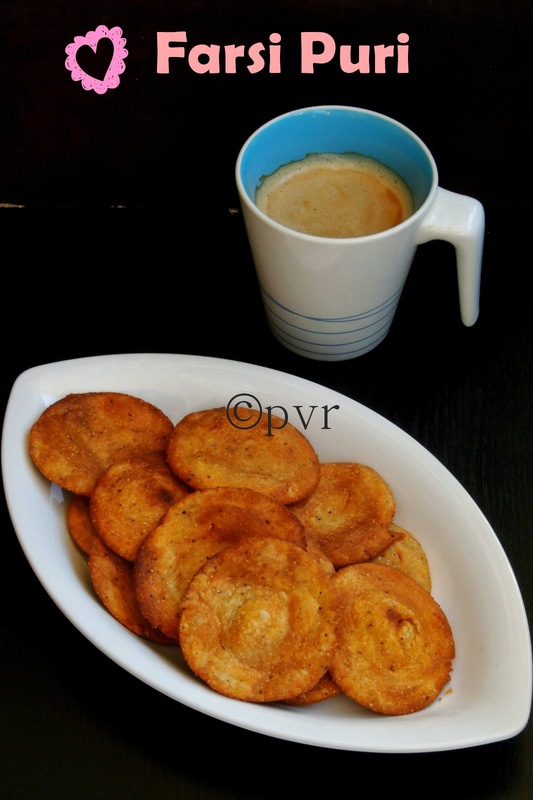 Tasty pooris like to munch this Gujrati snack with a cup of tea. oh they look so tempting!!! very nicely made!! Very easy to make, super yummy traditional snack. New recipe to me.looks so tasty..
looks like a nice homemade snack for tea time..
Farsi Poori looks very crispy and yummy. Farsi poori sounds inviting and intersting,looks irresitable,Perfect with tea..
Poori looks very interesting , I like the shape...well done ! Been a long time I made something like this...making the same..may be this week. Pooris look so good. love to try it. Looks crispy and yummy...love to try it..book marked. Looks like the spicy version of chiroti. Love to taste a few.. I am sure these puris are very addictive. Priya, these are looking so good. I almost wanted to have these for ICC once..yours have come out so well..great snack.. Very addictive. I too made the same. Wow Priya these are so deliciously tasty. I want to try these. Delicious snack.. Goes perfectly with tea & coffee.